This is a very popular Middle Eastern spread and one of the most popular of Greek appetizers. In Greek it's melitzanosalata or eggplant salad. In Lebanese it's baba ghanouj. In our household we just call it delicious. It's one of our favorite summer appetizer recipes. We have added this to our list of favorite make ahead appetizers. It's a great cold appetizer recipe for parties and it will definitely please your vegetarian friends. This Mediterranean inspired dish doesn't require any exotic or hard to find ingredients. I served it along with an Afghan Barbary bread from Bakhtar Bakery that I found at our local international food store. Pita bread would also be a perfect with this dip. Please read my "cook's notes" following the recipe. Prick the eggplant all over with a fork. Place on a sheet tray in the oven for 25 minutes. After 25 minutes place the unpeeled garlic cloves on the sheet tray with the eggplant and cook another 15-20 minutes, until the eggplant and garlic cloves are soft. Allow the eggplant and garlic to cool. Cut the eggplant in half and scoop out the flesh into a food processor. Squeeze the cooked garlic cloves out of their peels and add to the food processor. Add the spices, sesame seed paste, olive oil and juice of 1/2 of the lemon. Pulse until smooth. Season to taste. Serve room temperature. Serve with flatbread of your choice. 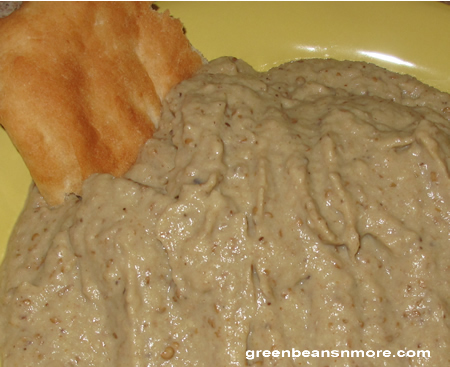 Cook's Notes: I have had baba ghanoush, so I knew how it should taste before I started this recipe. If it's your first time making it you'll need to do some experimentation. You really need to taste this dish to find what balance of flavors you prefer. I followed the recipe exactly. After tasting it I found I needed to add more spices, lemon juice and olive oil than is called for. I'd also suggest you add 3 cloves of garlic and taste it before adding the 4th clove. I ended up using 1/2 teaspoon of salt and 8 grinds of pepper. "Large eggplant" is a subjective term and the amount of spices you'll need is based on the size of the eggplant. Make sure you stir the tahini and incorporate the oil and paste well before you add it. We liked this best served room temperature.